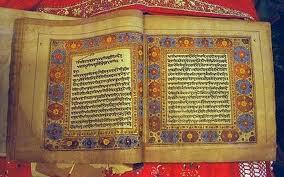 If any one wants a Sundar or Sukhamani Sahib gukta (book of hyms from Sri Guru Granth Sahib Ji), with full colored visharamm to contact Baba Darshan Singh Ji. Note: A "visharamm" is equivalent in English grammar to a comma, semicolon, or a period. These gutkas are specially designed to ensure that readers are pausing at the right words which helps with understanding the overall meaning of the shabad (hymn).